Niharika awarded T109284: Wrap-up report for "An enhanced cross-wiki watchlist" a Mountain of Wealth token. • Spage awarded T109284: Wrap-up report for "An enhanced cross-wiki watchlist" a Love token. Sitic created T110982: tools-bastion-02 (aka tools-dev) can't submit grid jobs. Sitic added a comment to T109656: Feature idea: show active sites in a filter bar above list. Ups, that was the wrong bug. I can't see the correct one right now. Sitic reopened T109656: Feature idea: show active sites in a filter bar above list as "Open". Sitic removed a project from T100157: Better filtering by namespace support: Patch-For-Review. Sitic added a comment to T100157: Better filtering by namespace support. Sitic updated subscribers of T100157: Better filtering by namespace support. Sitic merged task T109656: Feature idea: show active sites in a filter bar above list into T100157: Better filtering by namespace support. I'm going to merge it in T109656: Feature idea: show active sites in a filter bar above list for now, so I can find it again. 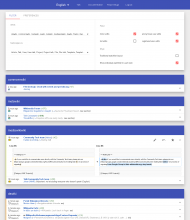 I think I need a tab next to filter and preferences which shows each wiki with the number of current watchlist entries and lets users disable, choose a color and set the order for each wiki. I'm just not sure how to implement it. 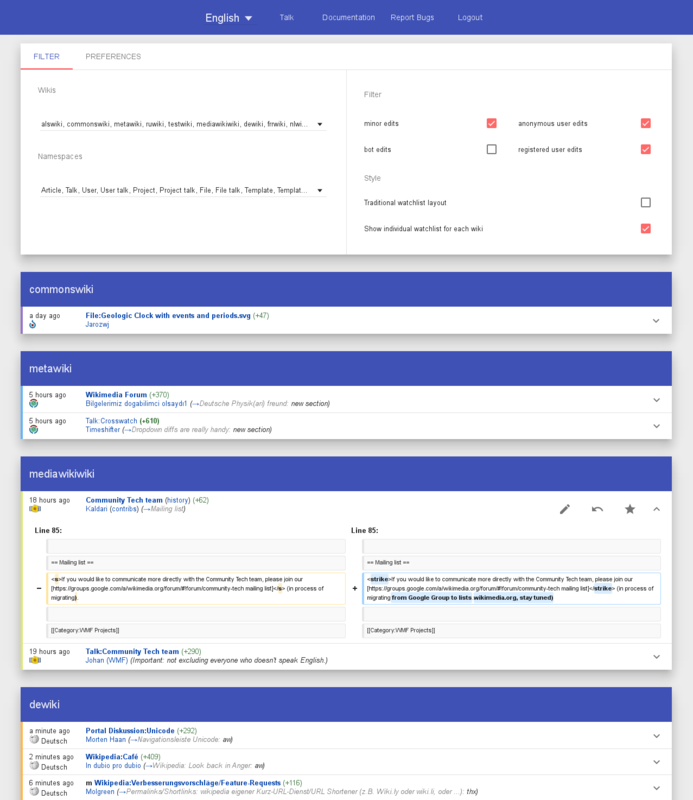 Sitic updated the task description for T100166: Weekly logs for project "An enhanced cross-wiki watchlist as an OAuth tool". Sitic renamed T101439: Better wikidata support from wikidata support to Better wikidata support. Sitic moved T100157: Better filtering by namespace support from Backlog to Feature Requests on the crosswatch board. Sitic moved T107836: Option to mute page, user or talk page section from Backlog to Feature Requests on the crosswatch board. Sitic moved T104607: Let users set the color assigned to a wiki from Backlog to Feature Requests on the crosswatch board. Sitic moved T100158: Allow watching cross-language page clusters from Backlog to Feature Requests on the crosswatch board. Sitic moved T105978: Group changes by page feature from Backlog to Feature Requests on the crosswatch board. Sitic moved T107784: Mark all read/hide all read from Backlog to Feature Requests on the crosswatch board. Sitic moved T107844: Incorporate site announcements from Backlog to Feature Requests on the crosswatch board. Sitic moved T108476: Live update from Backlog to Feature Requests on the crosswatch board. Sitic updated the task description for T109297: End-term evaluation for "An enhanced cross-wiki watchlist". Sitic updated the task description for T109284: Wrap-up report for "An enhanced cross-wiki watchlist". Sitic updated the task description for T92955: An enhanced cross-wiki watchlist as an OAuth tool. Sitic closed T104605: Decrease number of JS watchers as Resolved. Should be much better now, next step would be one-time binding translations, but this isn't supported directly by angular-translate. Sitic moved T100157: Better filtering by namespace support from In Progress to Backlog on the crosswatch board. Sitic closed T101438: Integrate with translatewiki as Resolved. Sitic closed T108247: Add crosswatch project to translatewiki as Resolved. Sitic closed T108247: Add crosswatch project to translatewiki, a subtask of T101438: Integrate with translatewiki, as Resolved. Sitic closed T109188: Support for subdivided watchlists as Resolved. Sitic added a comment to T109200: Mark links in red colour, when page don't exists. Sitic added a comment to T109222: Preference to give a OAuth Application the permissions only once. What's the point of having a "reauthorization" form if nothing about the consumer has changed (assuming valid request token and no revoked grants)? I wouldn't expect a user to click on "Login" on a tool in order to then revoke the authorization. If I wanted to revoke authorization for an app, the intuitive way for me would be to search for connected apps in the settings on my favorite wiki. I would suggest to go straightaway to the callback and not show any form, it seems to me that many large oauth service providers do it this way. Yes, sadly the watchlist API doesn't offer that directly. I would have to do a database check for each page to see if it exists without making crosswatch slow if the replica databases are blocked or slow (I don't like adding many database dependencies as those will break it from time to time. It's possible, but it might end up to be a bit complicated. Luke081515 awarded T92955: An enhanced cross-wiki watchlist as an OAuth tool a Love token. Sitic renamed T109188: Support for subdivided watchlists from Support for s to Support for subdivided watchlists. Sitic created T109188: Support for subdivided watchlists. Sitic created T109108: Check if cookies are disabled. Sitic renamed T107836: Option to mute page, user or talk page section from Option to mute talk page section to Option to mute page, user or talk page section. Sitic added a comment to T107836: Option to mute page, user or talk page section. MichaelSchoenitzer awarded T92955: An enhanced cross-wiki watchlist as an OAuth tool a Love token. Sitic added a comment to T92955: An enhanced cross-wiki watchlist as an OAuth tool. Hey @NiharikaKohli, sorry for the late reply (I've been travelling and only had bad internet the last days). @yuvipanda and I happen to be in the same place for the next days, so that should give us the opportunity to work on crosswatch. Sitic triaged T108476: Live update as Normal priority. Technically it would be no problem to add new items (e.g. every 5 minutes) to the watchlist. I agree that it should not cause inadvertently scrolling, so that's actually the hard part. Sitic closed T108547: Bug: several entries appearing as JSON as Resolved. 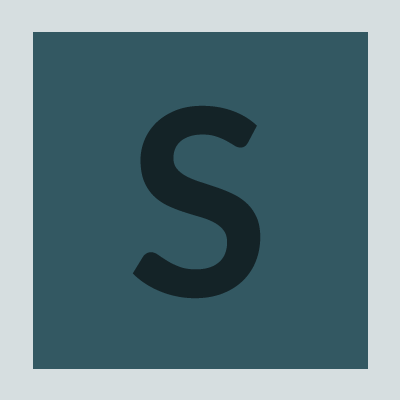 Sitic added a comment to T108547: Bug: several entries appearing as JSON. Thanks, that means that crosswatch doesn't have the translation message for that logevents (seem all to be from Extension:PageTriage). czar awarded T92955: An enhanced cross-wiki watchlist as an OAuth tool a Love token. Sitic placed T108247: Add crosswatch project to translatewiki up for grabs. Sitic created T108247: Add crosswatch project to translatewiki. Sitic closed T107735: Diff preview is too hidden as Resolved. I've added a expand/show diff button and a collapse diff button to each edit. Tooltip didn't really work, because there is quite a lot of clickable area with links inside, which might be a bit confusing. Sitic created T108060: Also show diff for new pages. Sitic created T108056: Create priority celery queue and workers. Sitic added a comment to T108000: Visual collisions in mobile view (Chrome, iOS). Thanks, yeah crosswatch is currently not designed for mobile and I'm not sure how easy it is to find a design which works on both. Sitic changed the status of T107736: Collapsible filter/preferences section from Open to Stalled. This is blocked by an upstream bug. I'll have to wait until the new version of angular material is released, which unfortunately brings breaking changes for me which need to be fixed first. Sitic moved T104607: Let users set the color assigned to a wiki from In Progress to Backlog on the crosswatch board. Sitic changed the status of T104607: Let users set the color assigned to a wiki from Open to Stalled. Sitic added a comment to T107844: Incorporate site announcements. Yes, that's correct. I'll have a look how the sitenotice/watchlistnotice could be done in crosswatch. This is not the first time this has come up, but muting a section would be error-prone if I use the /* SECTION */ information (sub-sections, section renames etc). Sitic moved T107735: Diff preview is too hidden from Backlog to In Progress on the crosswatch board. Sitic added a comment to T107784: Mark all read/hide all read. Hey, by mark all read do you mean that page titles shouldn't be in a bold font afterwards? Sitic moved T107736: Collapsible filter/preferences section from Backlog to Next up on the crosswatch board. Sitic awarded T107736: Collapsible filter/preferences section a Like token. Sitic added a comment to T107735: Diff preview is too hidden. Sitic created T107726: Fix another broken module import. FDMS awarded T107681: 2 user namespace prefixes instead of 1 in block log entries a Like token. Sitic closed T107681: 2 user namespace prefixes instead of 1 in block log entries as Resolved. Restricted Application updated subscribers of T72595: Flow: Standardize the usage of the Topics namespace (in Contributions, Watchlist, RecentChanges) vs. the master namespace (e.g. article talk or Wikipedia_talk), and whether Topic is needed in dropdown menus. Restricted Application updated subscribers of T62723: Flow floods watchlist. Restricted Application updated subscribers of T67361: Echo API: display filtered notification lists based on type. He7d3r awarded T101455: patrol support a Love token. Sitic closed T101456: flaggedrevs support as Resolved. It now checks if a page needs review for wikis which have FlaggedRevs. If so and the user has review right the diff and link to review the changes are shown. Sitic closed T106727: Add ORES support as Resolved. Deployed, it now automatically shows a diff, if ORES predicts that the edit will be reverted and the edit was not already reverted. It also adds an settings option to turn ORES off. Sitic closed T104572: Add buttons to revert change, edit and unwatch page as Resolved. It now has three buttons to edit, revert or unwatch (turns into a watch icon when pressed to revert the action). I'll add a button to patrol/review if the revision is not patroled/reviewed in the future. Also it shows the revert probability for T106727: Add ORES support there. Sitic closed T104572: Add buttons to revert change, edit and unwatch page, a subtask of T103679: Show diffs when the user requests it., as Resolved. Sitic closed T104572: Add buttons to revert change, edit and unwatch page, a subtask of T106727: Add ORES support, as Resolved. Sitic added a comment to T100166: Weekly logs for project "An enhanced cross-wiki watchlist as an OAuth tool". Sitic added a project to T106897: meta_p.wiki table corrupt (contains many NULL entries for 'url' field): Tool-Global-user-contributions. Sitic updated subscribers of T106897: meta_p.wiki table corrupt (contains many NULL entries for 'url' field). Sitic merged task T106976: Wrong links in GUC into T106897: meta_p.wiki table corrupt (contains many NULL entries for 'url' field). Sitic added a comment to T106897: meta_p.wiki table corrupt (contains many NULL entries for 'url' field). Sitic updated subscribers of T106170: Attribute cache issue with NFS on Trusty. I suspect this is a stale NFS file handle issue, I had a similar problem today. Sitic added a subtask for T106727: Add ORES support: T104572: Add buttons to revert change, edit and unwatch page. Sitic added a parent task for T104572: Add buttons to revert change, edit and unwatch page: T106727: Add ORES support. Sitic created T106727: Add ORES support. Sitic updated subscribers of T106452: Composer activity from Labs hosts can be rate limited by GitHub. Sitic merged task T100196: Ask Github nicely to whitelist Tool Labs into T106452: Composer activity from Labs hosts can be rate limited by GitHub. Restricted Application updated subscribers of T76560: Better WMF error pages. Sitic added a comment to T97133: Login integration for Sentry. They seem to be in the process of moving away from python/django-social-auth and implemented their own generic auth system in src/sentry/auth, see issue:1372. I'm not sure what the status of that is, I still see plenty of social-auth references. Sitic added a member for Tools: Sitic. Sitic updated subscribers of T105593: Some geolocated photos not shown. The OSM link goes to wiwosm, the Google Earth link goes geocommons. Both seem to miss a lot of images compared to https://geolocation.ws. Sitic added a subtask for T92353: Non technical: "Database reports" - status query: T78597: Ideas for reports. Sitic added a parent task for T78597: Ideas for reports: T92353: Non technical: "Database reports" - status query. Sitic updated subscribers of T106040: Edits by user results. Sitic merged task T104812: usersearch on Tool-Labs lists invalid URLs for Contributions by User to a page into T106040: Edits by user results. Sitic reassigned T106040: Edits by user results from Sitic to Sigma. Sitic closed T106040: Edits by user results as Resolved. Sitic added a comment to T103934: Convert all Labs tools to use cdnjs for static libraries and fonts. https://github.com/simonwhitaker/github-fork-ribbon-css is in cndjs and is a recreation of the Fork me on GitHub ribbon in CSS. Sitic created T106228: tools.wmflabs.org/cdnjs is outdated.